Peter Young took this photo on a crisp blue day, 21st January 1973. A lot of concrete features in the Honeywell building and there is more in the bus shelter and signage. The stop was on the Alder Valley and Thames Valley routes and bus numbers 91, 116, 704 and 705 were expected. Honeywell occupied Great West House on the Great West Road near Boston Manor Road: Peter adds 'It was the L-shaped tower-block on the south side of the GWR, on the right as you look towards Brentford Station. Before the tower-blocks were built, this was the site of the Jantzen swimsuit offices – the logo was a diving woman – and there was, I think, a neon-light version of this on the wall facing the GWR'. 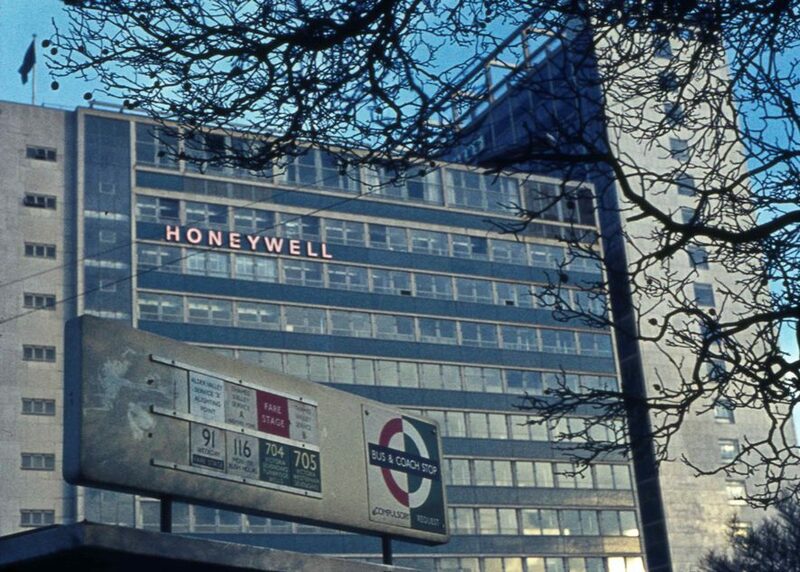 The Honeywell building is also remembered by Robert Hurst, who sent photos showing the Honeywell Computer Centre and its Christmas display, both from around 1979 and Patsy Langley, who encountered the Honeywell ghost in 1997. Full list of Peter's photos which include several views of the Great West Road and its buildings.